A Hopewell burial mound located on private property in Indiana that was illegally looted by road construction workers in 1988 and 1989. 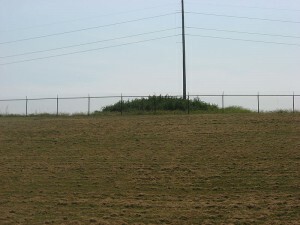 The so-called ‘GE Mound’ is part of the Mount Vernon archaeological site in Black Township, Posey County, Indiana. It is located near the entrance of a former General Electric plastics plant (now operated by Saudi Arabia Basic Industries Corporation) on private property belonging to the plant. The GE mound dates to approximately the first century AD and, at around 400 feet long, 175 feet wide and 20 feet high, was one of the five largest Hopewell mounds ever constructed (Munson et al. 1995: 136; Seeman 1994: 128). At least two intact individuals were interred in the mound along with a number of cremations. Although clearly used for funerary purposes, mounds such as the GE Mound would have served a number of ceremonial functions within Hopewell society (Seeman 1994). In 1988 an initial archaeological survey was conducted at the Mount Vernon site in advance of a federally funded road building project being undertaken by Boyd Brothers construction company (Seeman 1994: 127). Shovel test pitting produced no significant archaeological deposits, but the consulting archaeologist warned that if any artefacts were found during the course of the construction project, they must be reported to state authorities as per the federal building contract (Munson et al. 1995: 133). The subsequent borrowing of soil from the GE Mound by road workers revealed the presence of significant archaeological remains. These remains were neither reported to state authorities nor to General Electric (the landowner) and for three months starting in June 1988, the GE Mound was heavily looted (Munson et al. 1995: 133). An anonymous tip to law enforcement concerning a possible violation of state law led to a formal investigation into the looting in late 1988 and 1989. Archaeologist Curtis Tomak was able to confirm that the site had been looted with the aid of heavy machinery (Munson et al. 1995: 133). General Electric quickly moved to secure the site from further looting and pledged their full support in any ensuing investigation and prosecution. It was immediately clear that the looting related to the nearby road construction, but it was not clear what state and federal laws had been violated. In the lead up to arresting and charging those responsible for looting the GE Mound, several factors had to be considered. A complicated web of both state and federal legislation may or may not apply in any given context or jurisdiction in the United States, a situation that has been partially clarified by subsequent legislation. First and foremost at the time, the GE Mound was on private property and the owners of that property (General Electric) did not grant permission either for digging to occur at the site or for archaeological objects to be removed. Thus any act of digging at the GE Mound beyond that which was approved in the road construction contract was a clear case of trespass and vandalism under Indiana state law. This would be a state-level criminal charge. No person may sell, purchase, exchange, transport, receive, or offer to sell, purchase, or exchange, in interstate of foreign commerce, any archaeological resource excavated, removed, sold, purchased, exchanged, transported, or received in violation of any provision, rule, regulation, ordinance, or permit in effect under State or local law (United States of America 1979). In other words, since objects were looted from the GE Mound in violation of state law (see above), they could not be legally transported to another state. To do so would be a federal offence. 1. John William Way: an artefact collector and machinery operator, Way was the first to discover artefacts in the GE Mound while participating in federally funded road work. He carried artefacts from the site across state lines to his residence in Illinois and subsequently sold several pieces to Arthur J. Gerber. In March 1991, Way pled guilty to a misdemeanour charge under ARPA in exchange for his cooperation in subsequent investigations. He was sentenced to thirty days work release, two years probation, and was forced to pay a $2,000 fine. 2. John D. Towery and 3. Danny G. Glover: hired by Gerber to loot the GE Mound in exchange for a share of the spoils. They returned several times to the site but were expelled by a GE security guard. They transported artefacts from the GE Mound across state lines to Towery’s home in Kentucky and later sold some of them at an antiquities show. They were indicted in June of 1991 and in December Towery pled guilty to a misdemeanour charge and Glover to a felony charge under ARPA. Towery was sentenced to sixty days work release and two years probation and Glover was sentenced to 180 days work release and two years probation. Fines were waived for both Towery and Glover due to their inability to pay. 4. Arthur J. Gerber: a photographer and antiquities dealer was indicted in July 1991. He had previously pled guilty to criminal trespass charges related to the looting of an Archaic shell mound site in Indiana called Crib Mound. Gerber pled guilty to several counts of purchasing and transporting unlawfully removed artefacts and unlawful commercial sale. He admitted to several facts outlined in charges of conspiracy, ranging from knowingly trespassing on GE property to attempting to persuade others to not cooperate with law enforcement. Gerber was sentenced to twelve months in prison, supervised release for three years during which time he was unable to participate in activities involving the procurement or sale of artefacts, and was forced to pay a $5,000 fine. The sentence was stayed as he appealed his conviction. In July 1993 the US Court of Appeals upheld Gerber’s conviction. Gerber then appealed this decision to the US Supreme Court which denied his petition in January 1994. 5. Randall R. Hanson: a businessman and artefact collector who dug at the GE Mound on several occasions. Hanson initially offered Way money or drugs for GE Mound artefacts and later offered other looters money, guns, knives, and other items in exchange for artefacts. He transported GE Mound artefacts into Kentucky. In July 1992 Hanson pled guilty to four misdemeanour counts under ARPA and was sentenced to four months of home detention, two years probation, and was forced to pay a $5,000 fine. In assessing the damage to the archaeological record caused by the looting of the GE Mound, it is worth looking into the work of archaeologist Mark Seeman who served as an expert witness during the investigation. Seeman records that the more than 3,000 GE Mound artefacts recovered by the FBI were valuable and impressive (Seeman 1994: 128). They included numerous copper and silver body adornments, copper and stone tools, and even three copper pan pipes, among other items. Yet the true value of the site lay in the exceptional preservation of organic remains. Seeman discovered that the looters had encountered, and in many cases destroyed, fabric, leather, reed pan pipes, and wooden artefacts: classes of artefact that are exceedingly rare at Hopewell sites (Seeman 1994). This interesting information about Hopewell material culture has been lost. As a result of the looting of the GE Mound as well as the contemporaneous looting of nearby Slack Farm, Indiana state law was modified to require all people who plan on conducting excavations at archaeological sites to seek approval from the Indiana Department of Natural Resources (Munson et al. 1995: 142). Further court cases stemming from this change clarified that the law did, indeed, apply to private as well as public land. Munson, Cheryl Ann, Jones, Marjorie Melvin, and Fry, Robert E. (1995), ‘The GE Mound: An ARPA Case Study’, American Antiquity, 60 (1), 131-59. Seeman, Mark F. (1994), ‘When Words are not Enough: Hopewell Inter-Regionalism and the GE Mound. Posey County, Indiana’, in M. Nassaney and K. Sassaman (eds. ), Native American Interactions (Knoxville: University of Tennessee Press), 122-43. United States of America (1979), ‘Archaeological Resources Protection Act’, 16 USC 470aa. 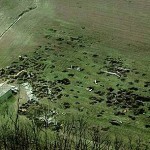 A Mississippi site in Kentucky where around 650 graves were looted over the course of two months in 1987.